I wear all the hats in this company (inventory control, accountant, bookkeeper, packager, research & development, web designer, customer service, pick up and delivery of supplies, scheduler, box-maker, peace-keeper, cleaning lady, cook, etc.) and there just isn’t enough hours in the day to do everything I have to do to ensure orders go out in a timely manner and also answer phone calls. I ship out between 60 and 80 orders per day 6 days a week, answering (or making) phone calls just isn’t possible at this time (I barely have time to talk to my mother as it is). To be honest, the vast, vast majority of the questions I am asked are answered right on the product pages or on this page, our frequently asked questions page. I am more than happy to answer any question you may have via email. I can generate an email response in about 30 seconds, while the average phone call lasts 15 to 20 minutes (or more). I apologize in advance if you do not like this policy. Until I learn how to clone myself a few times, this policy will remain in effect. If you are nervous about putting your credit card information on the internet, please feel free to mail in a check or money order for your order. Think about this: It’s much more dangerous to hand your credit card to some 16 year old with purple hair and a nose ring working the cash register at a convenience store than to put it on a site like this that has digitally encrypted security surrounding credit card transactions. As soon as your click on 'checkout', the web address changes to https//: which signals a secure page. Most orders ship out within 1-3 business days (and a few even ship within a few hours). We do not ship Fed-Ex, DHL or USPS Media Mail. Some products have a 7-10 business day lead time (or more), most are marked as such but from time to time there may be lead times on additional items. We will ship UPS Next Day Air or USPS Express Mail by request only & only if the following applies: The order MUST have the same shipping and billing address AND that must exactly match the name and address on the credit card payment. No exceptions, ever. If paying with Paypal, must ship to a confirmed address only. UPS Next Day orders will always require a signature at delivery with no exceptions. Our daily UPS pick-up is at 9:30 am (est). Orders placed for expedited shipping will typically ship out the next business day. **Choose USPS Priority Mail shipping (domestic) and the cost seems very high? Please be advised that whenever possible we try to use the USPS Priority Mail Flat Rate products. We then either refund the excess shipping or add in extra product to make up the difference most of the time. The small flat rate boxes and envelopes are approximately $6 to $8 for each box or envelope the order requires including insurance. The medium flat rate boxes are approximately $12 to $16 for each box the order requires including insurance. Please note that not all orders can be shipped in this fashion due to size and some orders require multiple boxes. Will you ship my order using my UPS account number? No. Please do not ask. If you put 'ship on account #XXXXXX' in the comments section, we just delete it. Your card is charged when you place your order. Approximately 99% of all orders ship within 1 to 3 days so this really isn’t an issue. If you are placing an order for an item that is not in stock or for a larger order with a lead-time, we will still charge your card at the time of purchase. This pre-order effectively secures your order so that when the product is back in stock we can ship immediately. Hey, I emailed you and never got a response. Why? Many ISP's send our emails to a bulk mail folder so please check those first. Or, you may have asked a question blatantly answered by a mere glance at our site (Do you have adhesive magnets?) or a question answered on our 'frequently asked questions' page. Do you have any restrictions on international orders? In addition to the countries above, we do not ship to any other locations in Africa. We will not at any time ship to an international freight forwarding service here in the US. This list may change at any time at our discretion due to an increase in insurance claims and fraudulent credit card transactions and other country’s trade restrictions or import practices. 1. Front and back copy of credit card to be used. 2. A photo identification that contains a signature and matches the first and last name on the card being used. We are in no way responsible for late international orders. We ship in a timely fashion in the method you select, if it takes longer to receive your order we apologize but we will not make any refunds for international orders. They take up a lot of time to fill out customs forms, make a special trip to the post office, wait in line, etc. Hey, I tried several times to place my order yesterday and it kept declining. I finally realized I was entering the wrong billing address. Once I fixed the billing address, my order went through but now I see my credit card has been charged 4 times for my order. Can you please refund the other 3 transactions? You are seeing authorizations placed on your account by your credit card company each time you attempted the transaction. Those extra authorizations will drop off your account in about 24 to 48 hours (sometimes more, depending on the financial insitution you are dealing with). We do require that you enter the exact billing address as shown on your credit card statement. If I select ’Personal Check’ or ’Money Order’ as my payment preference, how does that work? Once you have selected one of the 2 above options, you are given the chance to print out your invoice. The invoice will include our payment address on it. Print out the invoice, mail it to us along with your payment. Orders DO NOT ship out until we have received your payment and the payment hascleared the bank. No exceptions. If you select check or money order as your method of payment, we do NOT hold merchandise. This means that if a product shows in stock when you place your order but goes out of stock while we wait on your check, your order will ship out when the item becomes available again. If you pay with a mailed in check or a money order and need to return your order for any reason, credit is issued as store credit only. *This also applies to payment via Paypal E-Checks. The E-Check must clear before we ship the order out. No exceptions. Can I pay with a Purchase Order or C.O.D? No. 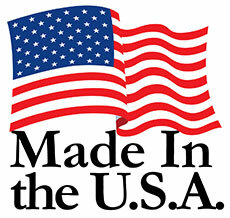 We accept Paypal, MasterCard, Visa, American Express, Discover, E-Checks, Checks or Money Orders. Payment must be received before any order is sent out. If you email, mail or fax a purchase order it will be discarded with no notice given. We currently accept MasterCard, Visa, American Express, Discover & Paypal. Will you send me free stuff to help our charity Save the Snails, Empower the Emus, etc? We receive approximately 25-35 requests per week from people asking for donations of material for all kinds of causes, some near-and-dear to my heart (others, not so much). We used to send donated material to organizations, but we found a better way to help more people. We donate 10% of our monthly profits to several organizations that help people all over the US (and also the world). Among the recipients of the donations are: Red Cross, United Way, Doctors Without Borders, American Cancer Society, Relay for Life plus several other smaller and local charities including a battered women’s shelter, several youth organizations and local schools. I firmly believe that I have been blessed with the success of this business and it is my responsibility to give back and this is the way I have chosen to do so. Can the standard thickness (12 to 18 mil) inkjet printable material be printed on my printer? I have a (insert printer model). Please don’t email and say, ’I have a _____ printer. Can this be used in it?’ I don’t have every owner’s manual to every printer ever made and each printer has different wear patterns and capabilities based on previous use. 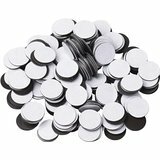 I have been selling these products for 8 years and have only come across three customers that said the standard thickness of magnet (12 to 16 mil) wouldn’t feed through their printers properly. All three of those were the all-in-one type printers (printer-copier-fax). Read the owners manual for your printer or look up the manufacturer’s online documentation for the specs on your printer. 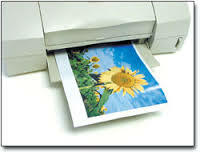 If the sheets will not feed through your printer properly, please visit our returns page. What’s the difference in the 12 mil, 20 mil, 30 mil & 60 mil Adhesive Business Cards? The 30 mil business cards are a thicker material, more like the business cards you would purchase at the big office supply stores. The 20 mil business cards are perfect for people that want to include magnetic advertising in mailings, as they are lighter. The 60 mil business cards are really, really thick and also have a closer pole spacing making them magnetically stronger. The 12 mil magnets are really, really thin and are meant to pretty much just hold a paper business card to a fridge. Is a thicker magnet a stronger magnet? Not necessarily, but usually. The magnetic properties of a magnet are not determined by the thickness of the magnet, but rather by the spacing of the magnetic poles of the magnet. I know this is vague, but it's not an exact science. On average, the products we sell on our site will be stronger the thicker they are. Not a lot, but a bit stronger. Is this product exactly like the ones I bought at the store (or thinner, thicker, etc.)? I do not have access to every office supply store’s inventory nationwide. 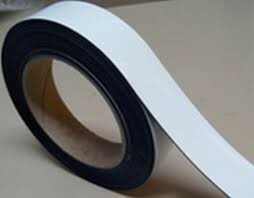 I can tell you how thick our material is and how it compares in general to office supply store products. 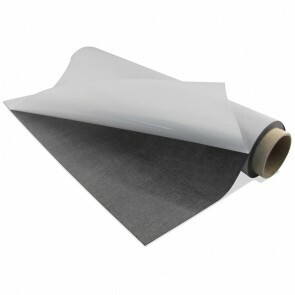 Our printable material is, in general, thicker than printable products sold nationwide. If you are concerned about the thickness, see the next question. How thick is a mil? One sheet of copy paper is about 4 mil in thickness. Thus, a 20 mil magnet is about as thick as 5 pieces of copy paper stacked together. A 16 mil magnet is comparable to 4 pieces of copy paper stacked together, etc. If you would like to know how thick a certain product is in inches, millimeters, etc., please visit one of the many unit conversion tools available free online. I have included a link below to a good one we use a lot. In the box on the left scroll down and highlight ’mil’ and in the right box scroll down and highlight what you would like to convert it to. Enter the mil given on our site (16, 18, 20, 30, 60, etc) and click ’convert’. I placed an order two weeks ago and placed one a few days ago for the same product and this order feels a bit thinner/thicker than my last order. Why? We specifically state on our homepage (and at the bottom of every single page on our website) that all magnet will be +/- 2 mil in thickness. While we strive for consistency, you may notice a small difference between orders since they may come from different batches. If you are purchasing magnet to print on to fill an order for one of your customers, please try to order all of the magnet at one time. This will better ensure all sheets are the same thickness for your customer’s order. Are the Adhesive Business Cards magnetically strong? Each card will hold up several pieces of copy paper on the fridge with the exception of the 12 mil, which is meant to just hold a paper business card to a fridge. Are the Printable Magnetic Business cards strong? Again, each card will hold up several pieces of copy paper on the fridge. If I buy 1,000 sheets of material, will you give me a discount? The pricing on each product is set up so that the price per piece drops as the quantity increases, so the quantity discount is already included. 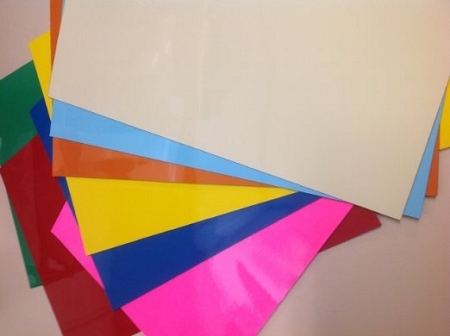 If you would like to place an order for over 1,000 sheets of any one of the materials (or a combination of printable products), please visit our wholesale site at www.wholesalemagnet.com. I want to buy a bunch of stuff, will you ship it for free? No. When you checkout, the shipping costs for the materials you have purchased will be calculated and added to your order. We do occasionally run special ’free shipping’ offers on certain products to US Addresses but you must be signed up for our newsletter to receive notice. I chose one method of shipping and my order was shipped via a different method. Why? We will never downgrade your shipping method to a slower method. We will, in some cases, upgrade orders from USPS Parcel Post or UPS Ground to a faster shipping method depending on where you live. This won’t happen all the time, but it will happen occasionally. If this is a problem, please let us know before placing your order and we will make sure your order ships out via your selected shipping method. (One customer’s ex-husband is her UPS delivery person so she’d rather the mailman brings her orders, etc). If you give a P.O. Box as your shipping address but select UPS Ground as the shipping method we will attempt to contact you via email for a corrected shipping address. If we receive no response from you within 12 hours we may use USPS Parcel Post as the shipping method. No refund will be given in these cases for downgraded shipping. I want to try one sheet of (insert product) to see if it meets my standards. Will you send me one sheet or piece for free? We do not send free samples.